Material: Polyester + Cotton,Soft and lightweight material,provides you a comfortable feminine touch. 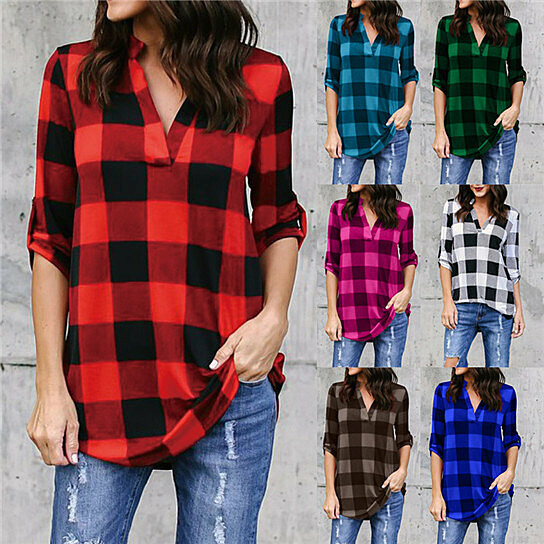 Features: Womens tops with classic plaid print.roll tab sleeve tunic .Notch v-neck,high-low curved hem,pleated back and flare front-could hide the tummy well. The High Low Curved hem which adds a bit of casual and fashion is slightly flared, so when you wear it with leggings, it looks a little dressier. This blouse is either casual or classy, pair it with jeans for the weekend or with trousers for a professional ensemble. Size: Small, Medium,Large,XLarge,2XLarge,3XLarge,4XLarge,5XLarge,Please check size chart in last photo.